Though Ford’s overall retail sales were flat in February, the aluminum F-150 continued to fly off the lots and helped give the company a 7 percent gain in F-Series models sold, the company said Tuesday. Counting both fleet and retail sales, F-Series and Ford overall were down for the month. Company sales fell 1.9 percent, and the F-Series was down 1.2 percent. This was fueled by an 18 percent drop in February F-Series fleet sales, probably attributable to a lack of 2015 F-150s to buy. Ford right now only has one plant online manufacturing the radical aluminum truck. However, production should begin on schedule this month at the second F-150 plant, the company said, and employees at the Kansas City factory are in training now. Fleet buyers understood the slower rollout schedule for this year’s F-150, Ford sales and marketing Vice President Mark LaNeve said during a sales call with analysts and media Tuesday. “It’ll increase every month,” LaNeve said. 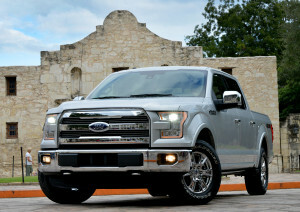 Ford U.S. sales analyst Erich Merkle said in January that the 2015 trucks are expected to become the majority of F-150s sold by the end of June. So your shop had better decide whether it wants to undertake the expensive training and equipment purchases recommended to work on the F-150. Find out more about that here with our coverage of an Auto Body Repair Network webinar and here with our in-depth look at aluminum dust. Merkle said on the call it was a “very good month” for full-size pickups, rising to 12.6 percent of industry sales from 12.1 percent a year ago. He also said on the call that small SUVs were anticipated to overthrow cars as a percentage of sales this year; that category rose to 18.5 percent from about 17.5 percent last month. LaNeve said on the call premium-trip F-150s were leaving the lot in 16 days, and Platinum models were only staying 12 days. No turnover time was given for the regular F-150s. In January, the 2015 F-150s sat at dealerships for an average of 12 days, and high-end models moved out even faster, with the King Ranches and Platinums gone in 10 and nine days, respectively. Merkle couldn’t say if the demand for the higher-end F-150s mirrored that for the 2014 models in the first quarter of last year, and LaNeve observed that Ford couldn’t tell if the customer wanted those specific packages or just bought the more expensive models because that was what was available on lots. Prices were up $1,600 for F-Series trucks in February over last year, and up $2,000 for the F-150s, though model years weren’t available for either statistic. F-150 trucks were up $2,100 in January from January 2015.